Packing up your possessions sounds easy enough: You’ll do electronics one day, clothes the next, then the kitchen and presto! You’re done! But in practice, packing can become an overwhelming task. You’ll wrap the dishes in newspaper—or bubble wrap; put the electronics in their original boxes—you saved those, right? You’ll need more boxes.… and more….. And how exactly do you box up a floor lamp? There are a lot of variables in packing, and that’s why so many customers leave the packing and unpacking to Few Moves Moving Company in Raleigh, NC. We’re moving professionals with lots of experience, plenty of packing materials, and the know-how to make packing painless and trouble-free. 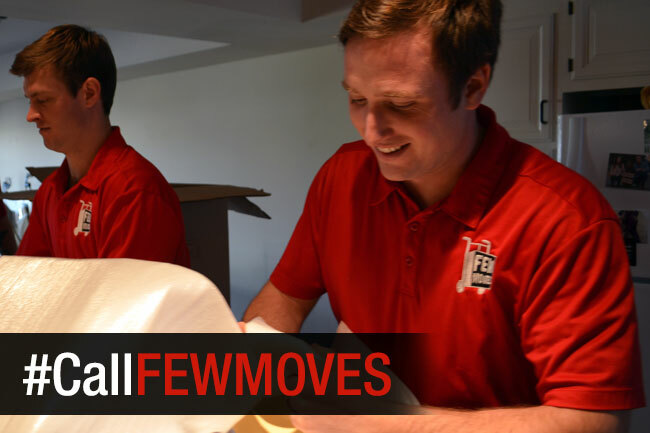 At Few Moves in Raleigh, we have all the bubble wrap needed to get your valuable belongings into a truck quickly and safely. Our team of experts is fully insured by four comprehensive insurance policies so that if the unthinkable happens, your valuables are covered. It’s all more reasonably priced than you may think. We can pack all or part of your home or business, and we can unpack it or you can do that task yourself. We’re happy to give you an estimate or an online quote. When we pack up your home or business in Raleigh, NC, we make sure everything is as safe and secure as possible. For us, packing is a daily activity and we have the expertise and equipment to do it quickly and easily. Those tricky items that require sophisticated packing techniques are no problem, because our professional movers have the experience and the materials to pack everything quickly and easily. You just can’t match that ability with old newspapers and boxes from the liquor store—not to mention the time it takes to do it yourself. Save yourself some stress and some heavy lifting, and call Few Moves Moving Company in Raleigh for a free estimate of our packing services. We’re surprisingly affordable.